Owners of heavy 5th wheel trailers seem to have a higher tire failure rate than other RV owners. I have been following the posts from a number of owners that have had a numerous problems. A recent question concerned the consideration of changing to 17.5 inch tires from his current 16 inch tires. "What is confusing is that tire pressure charts don't apply here. This is an older trailer and I may be trading it soon, but say I were going to keep it and put 17.5" wheels on it. Would I inflate to the maximum of 150 psi or would I refer to a pressure chart?" My reply: Tire charts are based on the ability of a single tire to carry a specific load at a specific inflation and speed on a test drum while running straight ahead. Most vehicles have four tires, one at each corner. A few like some one-ton pickups and vans might have dual tires but the load in dual application is reduced based on years or real life experience that indicates that if you run tires in a close side by side basis you cannot get the same life and durability as when those tires are run on opposite ends of the same axle. Now multi-axle trailers have been around for a long time but again most of these vehicles run the tires at the reduced "dual" load and also are probably running at the max pressure the tire is rated for. The use of multi-axles on RVs presents a different problem. The loads are not reduced to the "dual" load and the pressure on most RVs is not maintained at the max for the tire. In fact most RV trailers are running one or more tires in an overloaded condition. RV manufacturers produce many units that are significantly out of balance side to side as they leave the production line. Since cost cutting is a major objective for both the manufacturer and the RV buyer, larger tires are seldom provided and in some cases games are played by de-rating the GAWR to allow smaller (less expensive) tires to be used. I have even seen a case where the RV manufacturer got a letter from the tire importer claiming the tire was capable of carrying more load than was standard for that size. Of course this "special" information is not provided to the RV owner, who will probably buy a replacement tire that shows the correct size but is not rated to carry the same load. The manufacturers do not take into consideration the side to side unbalance, as to do so would require them to provide larger (more expensive) tires. The other thing RV industry does not take into consideration is the forces to the tire structure due to running close axle spacing. Engineering analysis shows that when turning corners the forces trying to tear the tire apart can be over 20% higher in multi-axle applications than with tires at the corners of the vehicle. The only options for the trailer owner are to up-size the tires (if there is room) or up-rate and increase inflation (if a higher Load Range tire and stronger wheels are available). Lacking the above being sure to run the tire at the inflation shown on the sidewall (i.e. max) will slightly decrease but not eliminate the overload forces. No, you should not run 150 psi. I doubt you will find that is the rating for the 17.5 tires or rims. What you should do is consult the load inflation tables and after getting accurate loads on each individual tire run no less than the minimum inflation for the heaviest tire on each axle. If you want to be more realistic and possibly see better tire durability for your tires, I would certainly consider using the "dual" load to establish the minimum inflation. I would further run +10% pressure to avoid day to day temperature and pressure variations. I would also consider a TPMS mandatory. "Hi This has been a question that I have ask and got a different reply as many time as I have ask the question. If a tire is rated for 80 psi as shown on the side wall is aired up to 80 psi. Then driven on a hot day the pressure goes up to 120 psi is that tire over pressure? If not then why? If so then what are we to do? Right now on my truck my tires are at 65 psi the tire shows 85 psi but when loaded pulling the camper it goes to 80 to 85 psi I asked the guys at the tire store and got no where with them. I like your blogs on tires and have got a lot of good info. off of them keep up the good work." Thanks for reading Russ. This is a good question. I and others many times warn about not exceeding the max pressure of a tire or wheel but we are always talking about the pressure when the tire is "cold" and by that we don't mean you can cool your beer by setting it on the tire. What is meant by "cold pressure" is when a tire is at the same temperature as the surrounding air and not in direct sunlight. You know, the temperature in the shade. Without going into the details of the "Gas Law" and looking at what is meaningful not just measurable, we find that using 2% pressure increase for each 10°F temperature increase works out pretty well for real life. This brings us to the obvious question of what is a "normal" temperature increase. Tire temperature will increase as you drive faster, or as you increase the sidewall flex by lowering the pressure or increasing the load. Being in the sun or near the exhaust pipe can also increase the temperature. The normal temperature increase over ambient is in the 30°F to 60°F range so I would expect to see a 6psi to 12psi increase in a tire starting at 65 to 70 psi. Now if you checked in the early morning while the day was still cool and then were driving in the heat of the day when it was 20°F hotter then we might need to add another 4% so we might see a 16% increase. If your normal cold inflation is 65 psi you could see a 10 to 12 psi increase on a hot day. In your question you were asking about a 40psi increase which is 150% of the cold inflation. If you saw that level of increase I would suspect there is a problem and that you have a bad gauge or the tire is very overloaded or you have excess moisture inside your tire because the shop did not drain and filter the air from their compressor. Your increase from 65 to 85 sounds high. I only see about half that in my Class-C. I run about 10 psi over the inflation required for the actual load and I drive at 60 to 63 mph and I see about 8 psi increase. 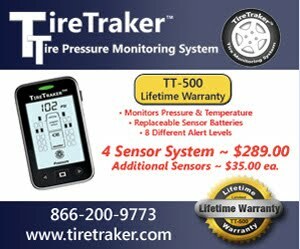 Have you confirmed your gauge and TPMS readings are accurate? Are you sure 65 is not leaving you overloaded? Remember you need to inflate to at least the minimum inflation shown for the heaviest tire on an axle and then I suggest at least a 10% increase for a reserve inflation factor. Tire & wheel manufacturers account for a normal pressure increase as outlined above when they design tires & wheels, so you should not be concerned unless you are seeing a large increase in pressure. If you do see a pressure increase like 25% you need to find out why. Remember you should not be bleeding down your tires when they are hot. Adjust tire pressure for better ride? Let me start off by saying I have really enjoyed your informative articles on the Internet. Your writing style is one that even the inexperienced can understand and learn from. Keep up the good work, we need the help! Inflation Number is achieved after the tires warm up? I know the NASCAR guys do this. The real reason I am asking about this is a problem I currently have with "expansion joints" on the highway. We are currently in the middle of a TX-AK-TX trip and my fillings are starting to fall out! If my front pressure is set at a cold pressure of 75, which is chart recommended for my axle loading, the bump from expansion joints can be tolerated. As the tires heat up and pressure goes to 85 and above the bump becomes more of a BANG which hits the front end so hard my dash has broken mounting screws in the past. Now that I have secured it to the chassis the dash is developing a horizontal crack. With the aid of my TPMS I could adjust my cold pressure to reach 75 or 80 hot pressure after a few warmup miles on the tires. I am currently seeing a temperature rise of 60 to 70 degrees above ambient between cold and hot tires. This reading was taken with a laser temp gauge measuring in a valley between the tread. I don't rely on myTPMS for accurate temp as it is a TireMinder with the screw on sensors. I know I could change my shocks to something softer on the compression stroke to take care of the "bang" but my ride and handling characteristics are really good everywhere else. What say Ye Great Tire Zen Master? Thanks for the compliment Bob, and for reading the blog. You pose a reasonable question Bob, but you fail to understand that the load/inflation tables are based on the fact that the pressure does increase as a tire is run. If you were to lower your “hot pressure” to match the inflation in the table you would probably soon experience tire durability problems and certainly see a hit in fuel costs and your rolling resistance, which is the force it takes to roll a loaded tire down the road, would immediately increase. If you are seeing 60 to 70 degree increase over ambient you may be running right at the low limit for tire inflation. You didn’t say how old or what size your RV was or the number of miles on it but shock absorbers do wear out and many times even when the RV is new there are better riding shocks available than the low cost ones that might have been selected by the RV manufacturer. You are correct about the temperature information from your external TPMS. The temperature you are seeing will most certainly not reflect the tire internal temperature. Watch my blog as I am conducting a test right now to collect the facts. I hope to post the report soon. Never bleed down hot pressure. You should consider the inflation on the load tables to be your minimum cold inflation. I usually recommend people run plus 10 % over the table long as they are not exceeding the inflation molded on the tire or the max inflation rating for the wheel. If you can’t run the +10% then you probably have tires and wheels that are lower capacity than what you need based on your actual loading. What is involved in doing a tire inspection? Some of you may wonder how I can provide an opinion on what caused a tire to come apart when all I see is a picture or two. 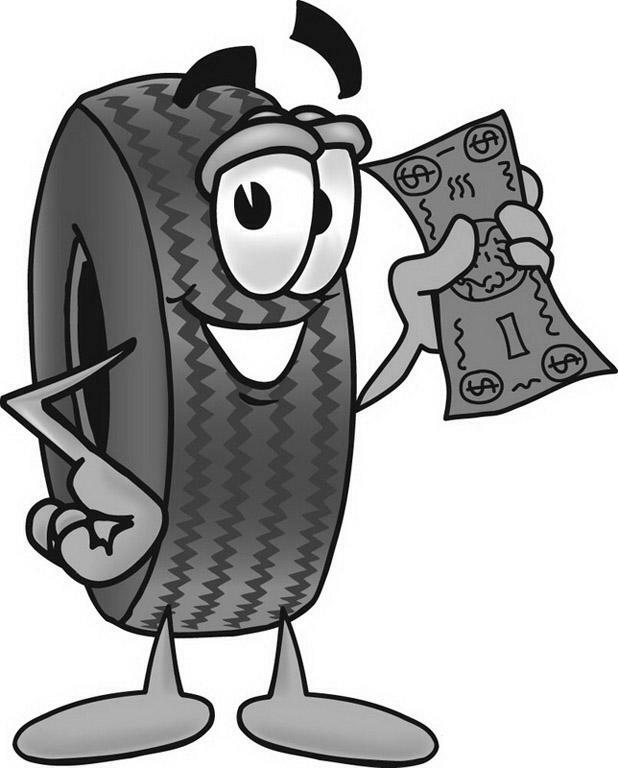 For many decades my primary job was to perform tire inspections and "autopsies." I estimate I did more than 20,000 inspections, so I was able to build a good experience base for my observations. My findings were many times presented to a customer that did not want to accept responsibility for the failure, so I needed to be very thorough and to provide an easy to follow explanation. Here is an example of just one such inspection. The tire was reported to have "blown out on a local road” The lack of facts and data did not help in the analysis of the tire. However I was able to establish that the tire suffered a sidewall puncture, lost air and after running significantly under inflated at highway speeds for a number of miles the cumulative damage to the tire resulted in a flex fatigue failure. Shows the 2 piece condition, which is indicative of, flex fatigue failure. Photo 4 shows a larger portion of the interior. Here I noticed the location of a possible small sidewall puncture. Picture 6 is what the outside looks like. The question is ... How do I prove there was a puncture? If I used a sharp probe like an awl some would think I might fave made the "puncture" myself. Over the years I learned a trick. If you take a paper clip and straighten it out, you can use it like a probe. The un-bent clip isn't strong enough to hold and doesn't allow you to force the end of the clip through the sidewall of a tire but if there already is a hole, the paper clip can be guided through the already made puncture. Picture 8 shows the clip on the outside at the suspect location. The tire was not defective but failed due to being operated significantly under inflated. The under inflation was caused by the small sidewall puncture. Use a TPMS. Instruct driver to be more attuned to ride & handling degradation, as this tire should be operated with 80 psi under normal conditions. A slow leak would have taken some time and resulted in significant changes in handling and vehicle response. Some punctures are hard to find. Sometimes the puncture occurred in the heavily damaged portion of the tire so it is impossible to demonstrate the puncture. 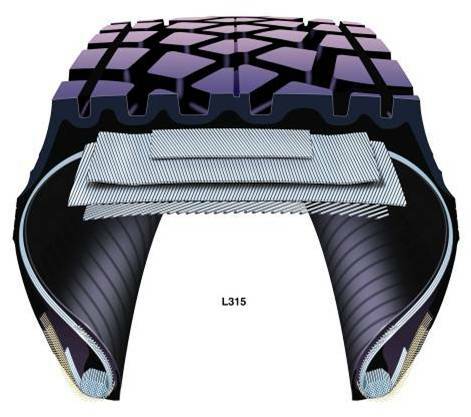 Melted polyester body cord is physical proof that a tire was run with only 10% to 20% of the proper inflation. "Ply Rating" is an old term left over from the days of cotton being used for tire reinforcement . Pre World War II. Today the actual number of layers or "ply" in the sidewall and tread are molded into the sidewall of your tires. The term "Load Range" is used today to identify the maximum inflation for a tire. The vast majority of Passenger tires and for the most part Light Truck tires have polyester body ply material and steel belts. Most Truck/Bus tires will have steel body and belts. In the picture above we see the two bias (angled) body ply plus the two angled belt ply in the bias-belted construction from an early Goodrich tire. The actual number of ply has decreased over the years as technology improved and stronger cords were developed so fewer actual layers of material was needed to contain the air pressure that is needed to carry the load. Also the switch from bias construction to radial allowed the decrease from 2, 4, 6, 8 or another even number etc body ply to 1 or 2 or 3 actual ply. This graphic is a basic representation of Bias, Bias Belted and radial constructions. Passenger tire might say "Sidewall 1 ply polyester, Tread 2 ply steel + 1 ply polyester"
Light truck might say the same as passenger but some larger LT tires might have two or even three body ply so they might say "Sidewall 2 ply polyester, Tread 3 ply steel + 2 ply polyester"
Truck/Bus tires will probably say "Sidewall 1 ply steel, Tread 4 ply steel"
Note Any reinforcement material that goes through the center of the tread is counted so the body ply material is counted in the tread material listing. Here is an example of a heavy duty traction design truck tire with one steel body ply and 4 steel belt ply. Do you need to balance your tires? I was recently asked about tire balancing. The person asking the question, said that they had done some research and learned there were three methods. They wanted to understand the advantages of each and which they should use for their Class-A RV. The mounted tire is placed on a balance and the heavy spot is counter balanced with weights. This is normally done with the mounted tire in the horizontal but I have also seen it with the tire on a special spindle as seen with this motorcycle tire as seen in this video. This static balancing is lower cost but does not provide the best balance. This method is not usually done any more by full service tire stores as it only affects the "static" imbalance and with today's light weight cars the driver is more likely to feel even a minor imbalance. I once had a car with one front tire 1/4 oz out of balance and on a very smooth portion of the interstate on my way home from work I would occasionally got steering wheel movement. A re-check at the store solved the problem. The car was a small light weight sports car and it just happened to be sensitive at that level. My one-ton dually pickup was not sensitive at the two ounce level on the rear axle. The next best method would be with the mounted tire on a "spin balancer", This rotates the wheel and tire at speed and electronically calculates where to place the weights. But truck/bus size tires can also be balanced using a heavy duty version of this type of machine. Spin balancers measures the up-down imbalance and the side to side balance and tells the operator how much weight to place on both the inside and the outside of the wheel to counteract forces in both directions. Finally there would be "On-Vehicle" spin balance this would give the balance for the tire, wheel and the brake drum and hub of the vehicle so if the drum was slightly out of balance it would be included and weights would counter balance all the spinning components. If you get this type of balancing done it is important to mark the wheel position on the hub if you ever remove the wheel to check brakes and to re-mount the wheel in the exact same orientation. A downside to this method is that it can't be done to tires on drive axles. but RV tires would be the same process but with HD bigger equipment. I see little reason to balance the rear duals on a Class-A as you will not feel the balance problem unless something was very out of balance. For Class-A I think you can just take the RV out for a quick test drive on a nice section of smooth Interstate. If you feel shaking either through the steering wheel or floorboards then you would go and have the front tires "on-vehicle spin balanced". For Class-C and smaller vehicles using 16" diameter LT type tires I would spin balance all six assemblies.